From the time Bella was born, Matt and I knew that we wanted our children to have a rich life experience...and that it wasn't going to come from spending 7-8 hours a day at school. And even though we were not homeschooled ourselves, it was something that we were excited about and embraced with open arms. But the term homeschooling is quite broad and it became somewhat overwhelming to navigate our options. As Bella approached that "magical age of 5"...we felt pressure to make a decision on a curriculum and get busy learning. However, the more I researched, the more I found that none of the curriculum were clicking with me. Fellow homeschooling friends would recommend different ideas....something else kept drawing me in. And that something was something called "unschooling". 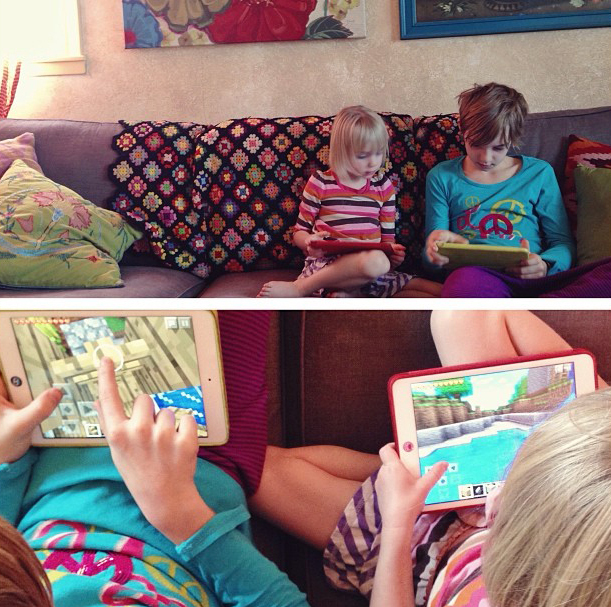 Unschooling is a lifestyle of learning. It is a type of homeschooling, but we do not "do school" at home. There are no workbooks, no desks, no memorization, no set "time" for school, and no tests. The child is FREE to pursue their own interests. Does this mean that we never help her in her journey of learning and she is just left to figure it all out on her own? No. As her parents, we are responsible for coming alongside her as a partner and providing learning opportunities based on interests...and guiding her when she asks. So much of learning is is based around play. But if our girls express interest in something...we will do whatever we can to help them explore that interest. For example, she is very interested in interior design. We checked out 30 books from the library on home design (ok...really I liked those too! ), we researched and sent for a course catalog from a design school in New York, and I found an interior designer in Denver that she can mirror for day. We spend time at night looking through design magazines and creating mood boards. Lastly, we watched A LOT of HGTV and analyzed terminology that professional designers use and the different trends in design today. The biggest difference from traditional homeschooling is that we are not actively "teaching" her. She is learning on her own by following her interests and passions. She is learning because she WANTS to. If we're sitting watching the sunset, we don't launch into a quiz session about the earth's rotation and the solar system. We sit and enjoy it together and if she asks questions about it (which she usually does! ), we can start to discuss it, but it's not a parent-initiated. For our family, unschooling is a natural extension of the parenting style that we have chosen. Attachment parenting and gentle discipline respects and nurtures the child...and we've found that unschooling does the same. We enjoy a very easy "flow" to our family life. We also don't have a lot of rules and restrictions surrounding food. We do have family meal times, but if someone is hungry before or after a meal or even after teeth have been brushed, we eat. Basically, we treat her with the same respect that we would a guest in our home. There is an excellent article that goes into more depth on the logistics of an unschooled life here: "From Control to Connection: An Unschooling Journey". I also really enjoyed this talk given by Astra Taylor, called "An Unschooled Life". Her biography reads: Raised by independent-thinking bohemian parents, Taylor was unschooled until age 13. Join the filmmaker as she shares her personal experiences of growing up home-schooled without a curriculum or schedule, and how it has shaped her educational philosophy and development as an artist. This is one of the questions that comes up a lot...and it's good to stop and really think about what the word socialization means. Socialization defined: "a continuing process whereby an individual acquires a personal identity and learns the norms, values, behavior, and social skills appropriate to his or her social position". Being socialized doesn't sound like something I want for my children. I want them to think OUTSIDE the box, not learn how to follow the "rules" of social position. What it boils down to, is that school is not teaching children about the real world at all. It does just the opposite. And instead of rambling on about it, please just read this. It spells it all out and is an interesting read. I took college calculus. I don’t use ONE thing that I learned in that class. In fact, I don’t use much of what I learned in high school either. I do use math to cook, go shopping, and figure out how old I am (after you pass 30, you start to forget!) My point is that life-learned math is much more applicable to…well….life! And if you run into a situation where you need to divide 68345 by 27, I’m sure a calculator will be nearby. In the case of those who wish to become an engineer or delve into any other math related occupation, they can learn it as they need/want to. You may want to read this intriguing article about kids learning math easily when they control their own learning. And more interesting thoughts on math here. It's been such a joy to witness Bella learning to read...completely organically. When she was 5 and 6, we tried using the 100 Lessons book for reading. It frustrated both of us and she decided she didn't want to do it any more. Throughout the next 2 years, she went through several phases of learning: wriiting in her journal (gibberish looking words), asking about words she saw while we were out, reading simple words while playing on the computer, writing letters to family and friends. At one point, she just decided she wanted to start reading books. So she would check out books from the library and we would go through them. I don't even remember the point where it tipped and she was reading everything. It just happened so naturally, without stress or coercion. It was likely around the age of 8 to 8 1/2 that she was reading Harry Potter books on her own. Reading is one of those things that makes other people REALLY uncomfortable. It's hard to trust the process when our schools are forcing kids to learn reading at such an early age. And that appears "normal". I prefer to let it happen EASILY. It should not cause undue stress. They will learn when they NEED to learn. For more information on unschooling and reading…click here and here. If our children decide to go to college (and it would be fine if they didn’t)…they will learn what they need to learn to achieve that goal. There are many unschoolers doing fantastic in college right now…and there are many who decided to take a faster (and cheaper) route to their dreams. Discipline, as in SELF-discipline, cannot be forced upon a child. Like adults, it is born out of a passionate desire to achieve. For me, I have self-discipline in my eating because I am passionate about health. I have self-discipline in my language and lifestyle because I am passionate about trying to live like Jesus taught me. The discipline was learned on my own because I was excited about these things. It was not something I learned sitting in classroom by being forced to sit and take tests and raise my hand to use the restroom. I have seen unschoolers study electronics, math, and science-related topics at length because it was interesting to them. Not because it was time for that on the curriculum. And they are thriving because of it. Each state has different laws regarding homeschooling. You can see each state’s regulations here. Those are my thoughts on unschooling in a nutshell. If you have a general question about unschooling, you may want to check out the starred web links below before commenting…they cover a HUGE range of topics related to unschooling and your question is most likely addressed there. If you are adamantly opposed to unschooling or homeschooling, please comment with a gentle spirit and know that this is what works for our family and we love it. We are not judging your choices…everyone needs to do what works best for them, and it’s definitely not for everybody. Not Back to School Camp: I cannot wait for my girls to be old enough to attend this camp. I wish that I would have been an unschooler so I could have gone Be sure to watch the video on the home page. Some of the above links are Amazon affiliate links. When you click on them and purchase, I will receive a small % of the sale at no extra cost to you. Thank you for supporting my blog in this easy way!